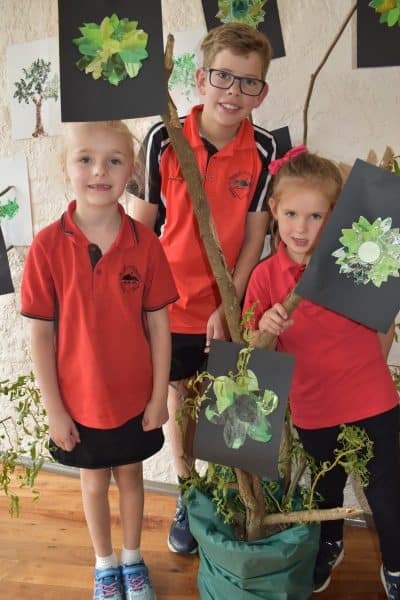 • Kids’ corner: Welshpool Primary School students Leila, Tyler and Daisy did their bit to create a stunning display at the entrance to the show. 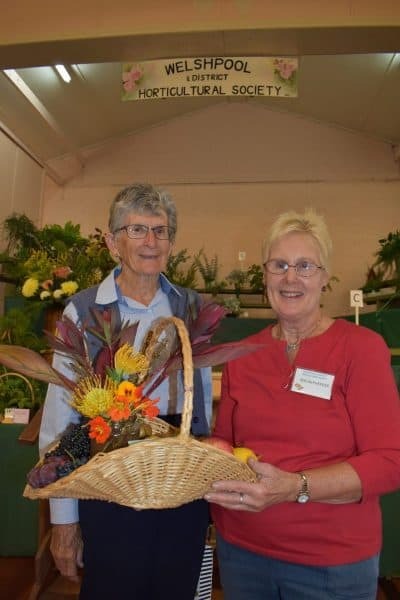 THE Welshpool Autumn Garden show has been proclaimed a “great success for exhibitors and visitors alike”. “The display in the Welshpool Hall provided a welcome relief from the stress of the extreme weather and bushfires of the previous week,” show publicity officer Helen Baud told The Mirror. “Exhibitors are to be congratulated and commended for the high standard of their entries and their commitment to sharing their outstanding skill and creativity as gardeners. There can’t be many other events that cater for and welcome and encourage participation from children of pre-school age right up to Senior Citizens. Helen said the show was a “huge team effort by club members”, which is “ably led by our ‘Superwoman’ Show Secretary Frances Grylls who keeps all the balls in the air and makes everyone feel valued for their contribution”. ”We look forward to seeing everyone at our Spring Show on Melbourne Cup Weekend in November,” Helen said. District Horticultural Society president Rosslyn McPherson show off one of the marvellous entries at the show. Renowned garden expert Mary Ellis opened the show on Friday, telling the audience she had started her research into the history of gardening in Victoria in the previous century. She said the Welshpool Horticultural Society had a proud tradition. “This society held its first show in November, 1960. This is the fifty-eighth Autumn show. The Welshpool society is probably one of the most active local horticultural societies,” she said.